Thursday mornings 9:00 am - 11:00 am; afternoons 3:00 pm - 6:00 pm. Sunday afternoons 3:00 pm - 6:00 pm. Oak Hill Farm strives to expand the lives of riders of all ages. We work with our clients to achieve independent riding as their physical abilities will allow. Our goal is to develop independence and strength. Therapeutic riding uses the horse and equine-oriented activities to achieve a variety of therapeutic goals, stressing the physical, emotional, social and behavioral growth of the rider. When riding a horse, the rider feels the horse’s soothing rhythm, strength, warmth, and movement pattern. This relationship between a horse’s movement at a walk and the movement of a normal human allows the rider to learn or relearn movements that may have been absent or impaired. As the horse walks, this movement is shifted to the rider, providing the stimulation necessary for stronger muscles, better balance and coordination, and improved gait. The student also gains self-confidence and experiences freedom never felt before. Safety always comes first at Oak Hill Farm. Specifically-designed ASTM/SEI approved riding helmets and break-away stirrups as well as tack for the comfort of the horse all ensure that the student has the best possible experience for horseback riding. Additionally, a special mounting ramp with a hydraulic lift is utilized for safe mounting and dismounting. 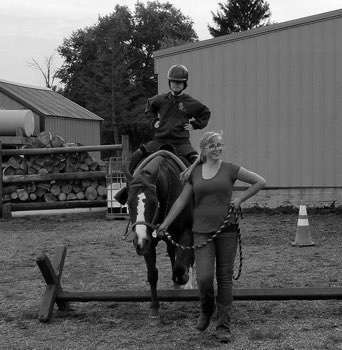 Equine temperament must include a love for people and a willingness to work around obstacles, such as toys, step-over hurdles, and other distractions used for therapy. Our horses are thoroughly trained to assure successful sessions. They possess strong confirmation lines for stability, footing, and strength to carry their rider. They are personally trained by their riding instructor and are present on-site 365 days a year. To buy tickets for our upcoming events, click here and view our page on EventBrite.